Hello, hello everyone! 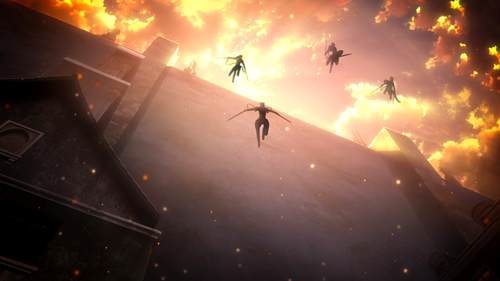 It is time for reviewing the most popular show of the past two seasons, Attack on Titan. It’s a monster of a task, so I’m going to quote myself a bit to start off. I wrote a review of the first six episodes a while back, so take a quick break away from this post to see what I had to say a quarter of the way through. 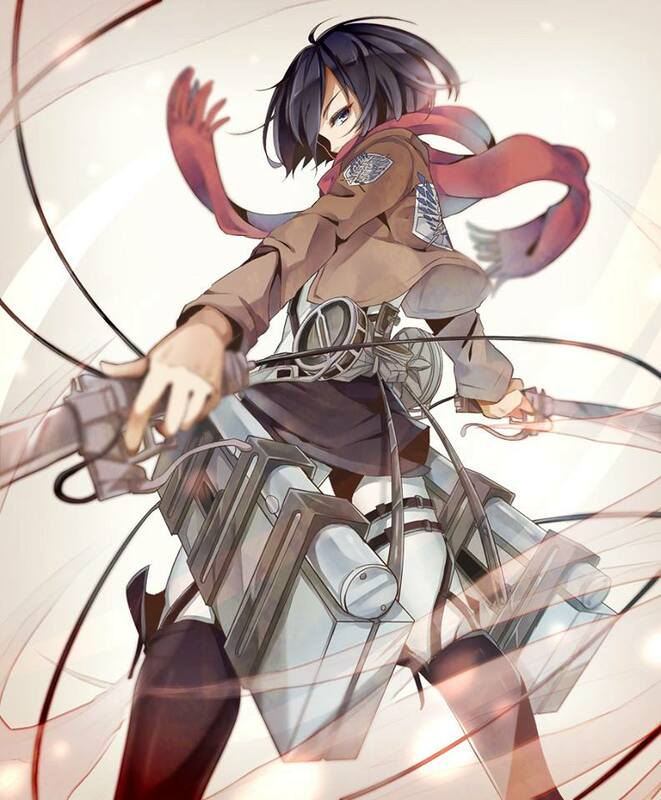 To see where I dropped Attack on Titan in my overall rankings, click here. That’s right, folks, I have four (4!!!) shows from the Summer 2013 season ranked ahead of Attack on Titan (Railgun S, Silver Spoon, TWGOK, Gatchaman Crowds). But before your outrage gets the better of you, allow me to explain myself. The greatest strength of Attack on Titan is its story, or, more appropriately, its plot. Inventive, intense and riddled with intrigue, this anime leads viewers around with question after question. And, for the most part, it slowly reveals answer after answer. Unfortunately for us, almost every answer is coupled with a new question. We are allowed to participate on equal measure with the characters in the story. Overall, we don’t know much more than they do, which helps to make the revelations more potent and the experience more visceral. The plot keeps the audience engaged. Even in the moments when I felt bored with the show, the desire to know more kept me watching. Now, in my first review, I lauded Attack on Titan for its ability to tap into human terror, as well as the fitting weight given to the deaths. After 25 episodes of watching people die in showers of blood, I don’t really feel that I can say that anymore. Although the gore was no less gut-wrenching (and occasionally nauseating), my emotional response became crippled. To make a death meaningful to the viewer, an anime must either 1) have created an emotional connection with the deceased, or 2) allow the viewer to feel the pain of the other characters. The slew of near characters and constant stream of bloody deaths wears out the viewers’s emotional response. For me, if you are going to make an anime as bloody, violent and tough to watch as Attack on Titan, you also have to make the carnage worth it. You have to justify the deaths with what you are trying to say. Throughout the show, an egalitarian perspective reigns. We send soldiers to their deaths so more people can live. This has always been a tough concept for me to swallow, even when I see the logic in it, my heart isn’t there. So, the real question is, does the message behind Attack on Titan justify all the death? From my understanding and sadly, no. If it was there, and I missed it, well…I’ll talk about why that may have been later on. The biggest reason I don’t think Attack on Titan pays off for all the blood is because it fails to offer an ultimate message of hope or a true validation of humanity. Towards the end of the season, we hear a lot of “to overcome a monster, you have to become a monster.” I hate that. In my mind, that discredit’s humanity’s potential to triumph over evil. And, while we are given some individual moments of hope (the sealing of the Trost wall comes to mind), they are more moments of hope in the plot than in message. This is really sad for me, but unlike Fullmetal Alchemist, which justifies all the violence and death it shows, Attack on Titan does not deserve a recommendation based solely on its merits. Yes, there an incredibly powerful moments, and I can list them–the end of episode 1, the sealing of the wall in episode 13, the Survey Corp recruitment in episode 16, pretty much all of episode 21–none of those can truly offer enough to balance the rest of the show. Aside from the themes, the greatest problem I had with Attack on Titan was the characters. Many of the characters were solely at the service of the plot (until the plot killed them), and those that remained were either left undeveloped or unexplained. In a show like this, where death is common, I’d expected to see a lot more of the emotional struggles presented to the characters. However, the plot overrides all in this anime. Instead of the characters moving the plot, the plot moved the characters. Presentation wise, Attack on Titan has varying strengths and flaws. The pacing struggles of the show have been widely documented and panned (struggles which I think have been overstated-no one was complaining about pacing while watching the show), but for the most part the animation is solid (excellent fight scenes), the music is GREAT and I thought the voice acting was well done. But all of that is really secondary to the overarching themes, messages and characters of the show. Did I enjoy watching Attack on Titan? Yes. I did. I really, truly did. It’s intense, engaging and, like any good work of art, flawed. The message is muddled at best and the characters are not allowed to drive the show the way they could have. Here’s my recommendation: if you care about being caught up on what’s big in the anime world, watch Attack on Titan. If you like plots full of intrigue, slick action and stomach the blood, watch Attack on Titan. If not, don’t watch it. Until the next season comes out to finish the story, the show as a whole isn’t worth watching. An amazing soundtrack, from OP 1 to ED 2. Slick action and an intense, well drawn out plot. There is, despite everything, the struggle against despair and the struggle to live. In some ways, those are worthwhile things to watch happen. I don’t really have too much of a problem with the pacing of each *episode*; I think it’s the pacing of the plot that’s the problem. I like that the Titans are mysterious, and that we don’t learn much about them right away, but we learn so little about them even at the end of 25 episodes, and as you pointed out there’s so little character development (except maybe for Jean), that once the emotional high you get after watching disappears, you’re left dissatisfied. If the focus had been more on the characters than on deaths, it would’ve been a lot better. For all the talk that there is about people’s lives being important, and not wanting people to die meaningless deaths, all that’s emphasized is the fact that people die in a most gruesome fashion. Like you mention, there’s no actual reflection on these deaths. I wish we could’ve gotten inside Levi’s head and heart, because it’s clear his squad was extremely important to him and their deaths were particularly jarring to him. If anything could make him question his commitment to the Survey Corps I’d think it would be something like that. The worst thing is that no one makes an active decision that yes, these deaths *are* meaningful, we’re going to make them meaningful. It’s all talk and passive acceptance: even if these deaths aren’t meaningful we’re going to keep on fighting, because what else can we do? It’s really weird: it’s like, they keep going because they have to, without hope, but almost as if they’re…hoping against hope. And it’s terrifying, because they are still just kids; but that is the reality of war. What do you think of Higurashi when they cry? I felt emotionally attached to every death in that one.